In recent times we’ve had the question posed to us time and time again by customers asking us if we think putting a QR code on their personalised coffee cups would be effective. Here’s my thoughts based on what I’ve seen work and what I’ve seen fail. First things first – what is a QR Code? You can think of a QR code as a paper-based hyperlink that connects the physical world with the online world. For marketers, QR codes allow advertisements, brochures, posters – even clothing or billboards – to direct users to mobile landing pages that contain much more information and interactivity than can be afforded on the printed page. This integration between print and web via mobile adds a new dimension of communication to any marketing or outreach effort.A QR Code works by simply scanning the code with a mobile device that is equipped with a camera and QR Code reader application. These applications can be downloaded for free on popular smartphone platforms such as iPhone and Android.Once the QR Code is scanned using the device’s camera it is translated into actionable information, such as a text message or mobile web page. They’re really easy to make and FREE. You can head to any number of QR generator websites, type in the website or landing page that you want to direct your target market through to and they’ll automatically generate a QR code for you for FREE. You can even get sites that will customise the code to your desired colour and include you logo as part of the code. These codes can be made much smaller than the information they contain. So instead of placing a long URL or lengthy instructions on printed takeaway coffee cups, you can simply place a small QR code. While your target market is holding the paper cup in their hand for 15-20mins, it’s more than likely that they’ve got their mobile phone in the other hand or at the very least within arm’s reach – perfect time to get them to scan a QR code. Now while you can certainly use QR codes on paper cups – that doesn’t automatically mean that you should. b) the incentive you give them to scan the QR code. If your demographic is used to using QR codes and you give them some incentive to scan – I think it’d be a winner. If you have an older audience that do not have a high propensity for using technology or particularly mobile apps – you’d probably be wasting your time. The other thing is that you can have the right demographic but unless you give them a reason to scan – it’s likely that they won’t. Competitions and giveaways are always popular ways to encourage your audience to scan the code. For the right demographic with the right incentive using a QR code has the potential to move the custom cup from a branding/advertising exercise to something that can deliver more information and offers to your target market. 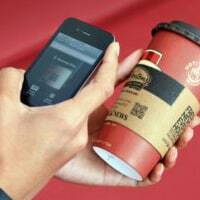 QR Codes on Paper Cups - Do They Work? Learn more about when it is best to use QR codes on custom paper cups. Find out what works and what doesn't.